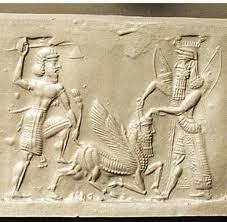 Myth in Gilgamesh research papers examine the role of the mythical in the epic tale. The first of the functions of a research paper on myth in Gilgamesh is to offer an explanation of certain aspects of one of the most universal aspects of human existence—the need to die. The second is to present to the world an ideal of correct and admirable behavior. The examination of myth in Gilgamesh research paper states that the epic drives home to us certain things about death. Most importantly, it tells us that it is for humans (and even humans such as Gilgamesh who is two thirds divine) universal. Gilgamesh is a great hero, of matchless strength and prowess, but his attempts to defeat death are futile. Gilgamesh is unable even to resist sleep for a week—how then could he be expected to resist the permanent sleep that is death. The Gilgamesh research paper notes that the relationship between sleep and death is much noticed in classical literature and in ancient Middle Eastern scriptures. His descent to the bottom of the sea to find the plant that has the power of restoring youth is successful, but it proves futile because this plant is later snatched away by a serpent. This myth poeticizes the meaning of death, gives emphasis to one of the most important aspects of its nature, utter universality. One of the characteristics that Gilgamesh possesses in common with many mythological characters is the status of having a mixed divine/human parentage. He is two-thirds God and one third man. Moreover, the fully divine members of the Mesopotamian pantheon display a particular interest in him, i.e., he is God-marked. The god of the sun has endowed him with beauty; the god of the storm has given him courage; collectively, “the great gods made his beauty perfect, surpassing all others.” Here is a person that seems purpose-built to fulfill an heroic, extraordinary role in the world, to build cities, go on journeys, and deal one-on-one with the gods themselves. We should remember that the classical myths, and certainly Christianity, are still alive in the sense that they still generate culture. A hundred years ago “classical education” gave every well-educated person a knowledge of Homer and Virgil and these myths are still very much with us not only in terms of producing literature (Joyce’s Ulysses), but also in a great deal of popular culture as well. The theme of mythic heroes and religious personages of semi-divine origin will probably never wholly disappear no matter how “secular” our culture becomes. It speaks to something too elemental in human desires to completely fade away. Gilgamesh and Genesis - Research papers on Gilgamesh and Genesis point out that the adventures of Gilgamesh and Enkidu, while they do not appear to have direct analogs in Genesis, nonetheless replicate certain components of the Genesis creation myth. Fate and the Gods - Fate and the Gods research papers discuss works by Homer and various other ancient stories. Archetypes in Literature - Archetypes in Literature essays discuss the literature model, in which other ideas are patterned after, that helps the reader connect with characters and plotting. Hedonists - Ideas of hedonism can be found in the Babylonian Epic of Gilgamesh, where the goddess Siduri advises men to make merry. Beowulf Epic Poem - Beowulf Epic Poem essays discuss the epic poem from the Early Middle Ages sometime between the 8th and 11th centuries. Chivalry in Sir Gawain and the Green Knight - Sir Gawain and the Green Knight research papers explore chivalry in the great work of medieval literature from the point of view of society, women and Sir Gawain himself. Historic Influence of Dragons on Human Culture - Historic Influence of Dragons on Human Culture research papers will explore the influence of dragons of various cultures throughout history. Middle Ages Literature - Middle Ages Literature essays discuss the history of literature produced during the medieval period. The Song of Roland - The Song of Roland research papers examine Roland's relationship to Oliver. Odyssey and The Wizard of Oz - Odyssey and The Wizard of Oz term papers discuss both novels as they relate to archetypal themes. Greek Literature Research Papers focus on the famous ancient Greek authors such as Homer, Thucydides and Herodotus. Ancient Greece - The world of Ancient Greece still influences many aspects of 21st Century life, albeit in slightly different forms, within the cultural identity of the modern world. Death in Ancient Greek and Roman Cultures Research Papers discuss the ancient practices of how the dead were taken care of. Ancient Greek Worship research papers examine the religious worship habits in Ancient Greece and in Greek Mythology. Myth in Homer's Odyssey - Myth in Homer's Odyssey research papers look at the roll of myth in The Odyssey by Homer. Women in the Iliad and the Odyssey - Women in the Iliad and the Odyssey research papers examine Homer's works in relation to their female characters. Penelope of The Odyssey - Penelope of The Odyssey term papers look at the wife of Odysseus. Athena in the Odyssey - Homer research papers discuss the Greek author's works such as The Iliad and The Odyssey. Themes of the Odyssey - World literature research papers on the themes within Homer's The Odyssey can be written on a number of very interesting topics. Lucretius - De Rerum Natura is a poem of 7400 dactylic hexameters, which is the same poetic meter employed by Homer and Virgil. Odysseus - Odysseus research papers look at the main character of Homer's classic tale of The Odyssey. Greek Epic - The Epic tradition is familiar with Homer and the grandiose Gods of Greek heritage. Epic Poetry - Epic Poetry essays discuss one of the oldest forms of poetry that tells a story, or narrative. Odyssey and The Wizard of Oz - Odyssey and The Wizard of Oz research papers discuss both novels as they relate to archetypal themes. Greek Mythology - Greek Mythology research papers focus on the Gods of Ancient Greece in literature by poets such as Homer. Paper Masters writes custom research papers on Myth in Gilgamesh and examine the role of the mythical in the epic tale.